Verizon ran the numbers and decided that with today's generation of mucho expensive smartphones, it is worth offering them at full price with no contract obligation. Therefore it is going all European - 15 of the best phones in its lineup will be available on prepaid starting September 2nd, if internal documents are to be believed. All the DROIDs and the Fascinate are in this list, as well as a bunch of BlackBerrys. Only Windows Mobile is left without prepaid at launch, but that's quite explicable considering that WP7 is approaching. You will still need to pay the full phone price upfront, choose a talk option, and get the smartphones a month-to-month data plan worth $30, or $10 for the "3G multimedia devices". Breaking the shackles of a two-year plan that ends up costing much more, though - priceless! 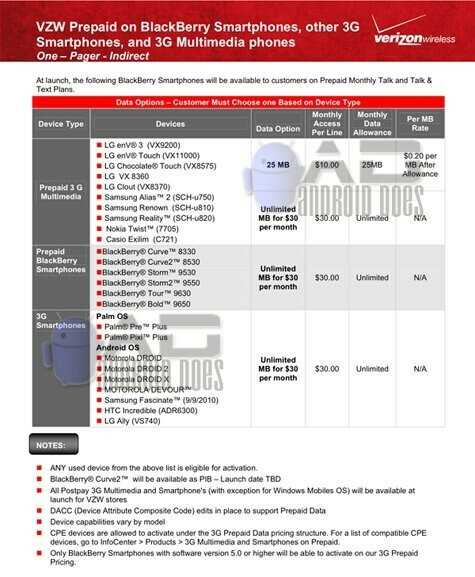 Have a look at the full device list below - no more "cheapo phones only" sign at the prepaid shelf. Pay full price on phone kids and parents don't have that kind of money, they may preferred 2 years contract and discount on phone. I am pretty sure... but a VZW person can chime in as I thought it was 1yr pricing on all phones + $20 on regular/multimedia phones and 1yr pricing + $140 Smartphones. NO rebates. Example: Curve 2 (8530) $100 yr price +$140 = $239.99 for Phone. No rebate. Also the plans can not have Data Only. You have to have the monthly prepaid plan plus data for the devices that require it. If you do not fulfill the entire Prepaid monthly plan + the data, then your phone will be billed at the per minute rate until full amount is paid. Example 2: Curve 8530 $44.99/mo 450Min Prepaid plan + $29.99 data = $74.99/monthly must be renewed in full otherwise if you only pay less than that amount like for instance $50. Then you will be billed .45c/min for calls till your balance reaches the minimum plan of $74.99. The LG Clout 8370 has the data plan? Has the option of a data plan. I am fairly sure you will need to have one of those data plans on there. I think the option applies to whether you want the $10 or $30 plan. I suspect those data options are additional features to the voice plan. BUT, you could sign up for the $/day or $.25/min plan, add a $30 pda plan, and $15/mo minimum for voice and have a PDA only plan for $45 a month. You can't. PhoneArena forgot to mention that a $45 voice plan is REQUIRED. So if you want to have 3G data you'll have to pay $75 in total including voice. Also no text plan is mentioned, so I'm guessing it'll be $.10/text. Really doesn't sound like much of a deal IMO. Although I could live with just the voice plan since I'm always around wifi. so I may be lost here but i didn't see that mentioned anywhere?? Engadget had a photo of the 8530's prepaid box on which it listed the required voice plans ($45-75). What they aren't telling you is that you can currently buy a phone at full retail and activate it on a month to month plan. Anyone who doesn't know that doesn't deserve to. I knew you could do it on AT&T...depending on what rep you get. Thing is, there isn't even small print that would let consumers know that the full priced option is something they can choose from. Generally folks have to ask. God help you if you activate online. so if this is correct you can buy a phone full retail put it ona prepaid plan and have to get the required data plan?? you can activate a smartphone or blackberry on a vzw prepaid account, the catch is you have to choose a monthly plan not a daily plan and you have to have the required $30 data package and everything has to be paid for before your month starts or you get no service. So yes its a good option if you require a security deposit and cant afford it or if you simply dont want a contract but even if you have a contract you can always buy a new phone at full retail price and activate it. those customers would be postpaid, one reason many people choose prepaid is to avoid the credit check and security deposit of postpaid.